About a year ago I read Crush It! : Why Now is the Time to Cash in on Your Passion by Gary Vaynerchuk, which basically explains how you can turn your interests and hobbies into a business using the internet. Gary illustrates the advice in Crush It! with his own experiences running his also shares his parents wines and spirits business Wine Library and turning it into a multi million dollar enterprise. If you’re thinking of starting a business, then Crush It! Should be on your reading list. 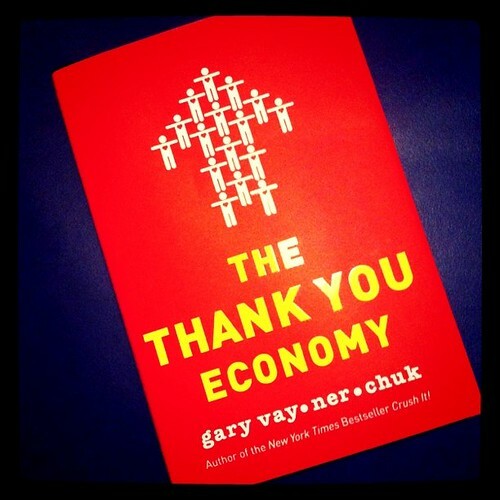 The Thank You Economy is Gary’s latest book and is a different book alltogether. It’s about building real relationships with your customers and your prospective customers whether that’s through technology (e.g. Social Media) or face to face relationships. If you’re a business that worries about whether you have 1000 followers on Twitter or 10,000 “Fans” on Facebook then you need to start thinking about them differently. How many of these followers or fans are you really connected to? It’s not the number of followers you have or “likes” you get, it’s the strength of your bond with your followers that indicates how much anyone cares about what you have to say. In this game, the one with the most real relationships wins. I’ve been listening to The Thank You Economy on Audio Book from Audible which is great for two reasons. Firstly, it’s read by Gary Vee himself who is an extremely passionate speaker, in fact one blogger referred to him as a “rapper” because he talks so fast and secondly because Gary goes off script – a lot with side notes, observations or updates. Gary is a great story teller and he fills the book with case study after case study about how different companies have used social media to build their brand and connect with customers. He dissects social media campaigns such as Procter and Gamble’s Old Spice TV adverts featuring Isaiah Mustafa and describes how Procter and Gamble missed an opportunity to connect with it’s audience to form a real relationship. Incidentally Gary Vee dismisses the phrase social media campaign as being no such thing. It’s something you should be doing all the time not just as a “campaign”. An interesting insight that he shares is about approaching building relationships as if you’re trying to woo someone who has just broken up with the love of their life. What a great idea. He contrasts this approach with the “Social Media Campaign” which he describes as being the equivalent of a one night stand. With his use of very visual language you quickly get the idea and grasp the points he’s making! Gary’s examples don’t just cover big businesses. He cites my new friend Joe Sorge (who I’ve met through Kitchen Table Companies) and his Milwaukee based restaurant business AJ Bombers. He describes Joe’s use of Foursquare to attract a “flash mob” of 161 customers at the same time to his restaurant (even more impressive at the time there was only 300-400 Foursquare users in the area) and increasing his typical Sunday sales by 110%. You can read a case study of Joe’s use of Foursquare on Hubspot. Over and over Gary cites examples of businesses using social media to actively engage with thier customers and build relationships. Even a dentist using social media to make the patient experience that much better. And you guessed it, getting an appointment with that dentist is difficult because they are booked solid. Put the best people in charge of social media, not the people you don’t know what else to do with. So, in summary, this is a really great book, it takes us back 100 years or so to a period when everyone traded with the local grocer and he knew your needs even getting the food ready before you turned up. Somehow with mass market and the big supermarkets this kind of service has disappeared. But service, like relationships should never have disappeared or been forgotten. It’s like when you’re nice to someone and then you ask the person a favor…that person is a lot more likely to do something for you if you’ve been a great friend and neighbor than if you’ve ignored him or her the whole time you’ve lived next door to each other. If you’ve enjoyed The Thank You Economy, why not share your thoughts in the comments below? Would you like a Free Copy of The Thank You Economy? Would you like a Free copy of the Thank You Economy on Audio Book – or any other Audio Book for that matter?